The Canadian Produce Marketing Association is pleased to recognize Lambton-Kent-Middlesex MP Bev Shipley as a 2018 Produce Champion. This recognition will be given annually to a Member of Parliament or Senator who has been supportive of the produce industry and effective at bringing industry issues to the fore on Parliament Hill. 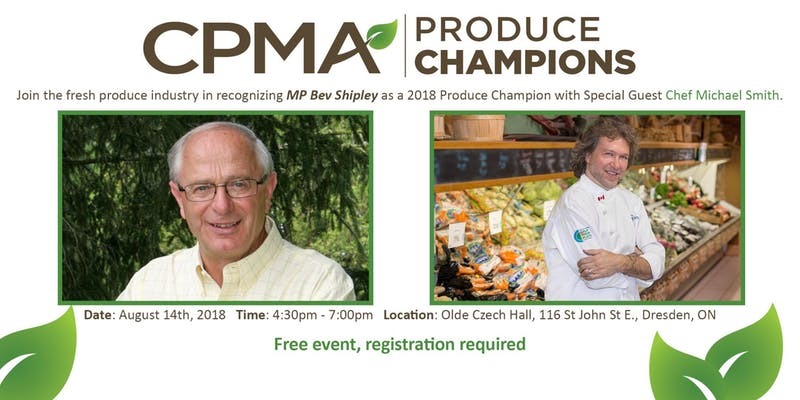 MP Shipley will be recognized at the Old Czech Hall in Dresden, Ontario, on Tuesday, August 14, 2018, from 4:30pm to 7:00pm. The event will feature a presentation by CPMA Half Your Plate Ambassador Chef Michael Smith, followed by an industry and community BBQ. All CPMA members are invited to join the event. The event is free to attend, but pre-registration is required.